Bumper Blocker set up instructions for using these bumper guards. 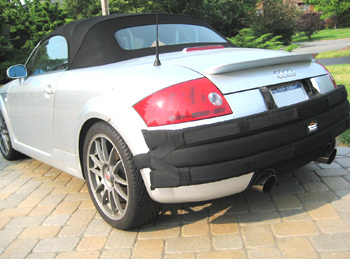 The 1st time you use your Bumper Blocker pad you will need to make slight adjustments to the product to ensure a snug fit around your car bumper. This will help the bumper guard in protecting your car bumper to the maximum. The Bumper Blocker has a bendable hook on each end of the pad that is shaped like the letter “U”. This “U” shaped bendable piece will be used to hook on the inside of your vehicle’s wheel well. The 1st time you use the Bumper Blocker you will be required to bend the “U” shaped pieces more or less depending on your vehicle’s wheel well height and depth. Note: The “U” shaped pieces of the Bumper Blocker are easily adjustable and bendable. Once you adjust it, it will hold its position for all future use. Once the you have the “U” shaped pieces adjusted to hold onto your vehicle’s wheel well, it is time to adjust the Velcro straps. Begin by placing the Bumper Blocker on your vehicle. You will notice there are 4 adjustable Velcro straps, 2 on the top and 2 on the bottom of the bumper guard. Simply open each Velcro strap one at a time and pull slightly to tighten. You will begin to notice the Bumper Blocker begin to huge your vehicle’s bumper more snug. Once you complete these 1st time adjustments, it will take you seconds to place and remove your Bumper Blocker on your vehicle in the future. You repeat the same instructions for both the front and rear bumper protection.